4YA Planning Guide: Anima Lens, Artifacts, Rainbow Crystals, and Magia! And you! Discussion in 'Guides' started by Kantolin, Feb 26, 2019. A lot of things are coming for our 4th year anniversary (4YA), which will happen in late March. Some of these are what has become the usual thing - a ticket-based orb farm, realms on parade, fantastic fest banners. The names are taken from the Japanese version of the game (Edit: Got Legendary weapons fixed! They are now 'Artifacts'). Odds are high that global will adjust the names; I'll probably edit this guide when that happens, although it will hopefully be obvious what is what. I am crazy verbose, so here's a tl;dr.
Anima Lens - Let you select relics from a large pool, obtained via getting dupes and via clearing events. Legendary Weapons Artifacts - Extremely powerful stat-stick weapons. Phase 1 are synergy-based, good for torments, Phase 2 are elemental-based, good for everywhere. Obtained with occasional frequency. Rainbow Crystals Prisms - Required to power up Artifacts. You sacrifice relics to gain these. Save all your relics, including the 1* to 4* relics, in your vault. Magia Crystals - Winning battles with level 99 units will get them extremely minor stat bumps. Awakening Soul Breaks - Extremely powerful soulbreaks; the next tier of power creep. Show up with kingdom hearts and on our 4YA, and become somewhat more common in the upcoming months. When Anima Lenses are released, you will be able to view every relic you've ever pulled - even if you combined/sold/deleted it. From that point on, any time you obtain a duplicate of one of the relics you've had already, you'll receive an Anima Lens (You'll still receive the dupe, mind you, you'll just /also/ get an Anima Lens). You then can trade Anima Lenses to select from a list of soulbreaks, essentially getting a bonus soulbreak selection. Roughly, between pulls and what they pass out in events, free-to-play players in Japan have discovered that you can get a free USB every month or so, and a free BSB notably more often. The most expensive choice ends up being LMRs, as level 2 lenses are not common and LMRs cost three times as much as other things in that category. Anima Lenses are a handy system for completing a character and for picking up important pieces that you may be missing. Despite Artifacts reducing their value, you can also get +Element weapons (Or more valuably +Element armour) via even level 1 lenses, as well as unusual things like Gordon's Moderate Fire Resistance shield. In addition, when making a selection (such as the 500gem USB select), it may help to glance here and see if it'd be more easily avaliable through Anima Lenses rather than spending money. In Japan, banners that were currently active when Anima Lenses came out did not give them, but future banners did. So for example, it came out /during/ a Realms on Parade, thus that RoP did not give out Anima Lenses... however, three months later during Japan's /next/ RoP, that one /did/ give out Anima Lenses. So any banners out before Anima Lenses exist probably won't be changed to allow for them, heh. TL;DR - Dupes give you relics, you get free relic picks every so often. These were originally also called 'Sacred Weapons', if you're searching for them on various sites. Periodically (perhaps 'once per event'? ), we will start receiving 'Lithographs' 'Artifact Stones' (A'la FFV). You can exchange these Artifact Stones for an Artifact, which are extremely powerful weapons that do not teach anyone a soulbreak. In order to power up your Artifacts, instead of using scarletite like we do for regular weapons, you have to sacrifice existing relics - turning them into Rainbow Crystals. Sacrificing 1* to 4* relics will give you 400 points. Sacrificing 5* relics gives you 2000 points, while sacrificing 6* relics gives you 4500 points. If your 5* or 6* weapons are combined, you'll get more points, but at a reduced rate. It is smarter to sacrifice two 5* weapons than a 5*+ weapon. You also gain points on 5* or 6* weapons that have been augmented. Rosetta stones on 5* or 6* weapons will also get you points, and this is smarter than sacrificing Rosetta Stones directly since you might get a major augment. (Note: 1* to 4* relics do not care if they're combined, augmented, or anything. So long as it's between 1* and 4*, you'll get 400 points). One Rainbow Crystal is 2000 points, and it takes 50 Rainbow Cystals to cap out an Artifact. To sum up what I've stated thus far: We get Artifact Stones, you trade them for Artifacts, you spend other relics to max out your Artifacts. Keep all your relics, even your 1* to 4* relics, saved in your vault for this feature (Vault space is cheap). Keep relics you're planning on sacrificing separate (do not combine them). Anywho, Artifacts presently have two categories. Phase 1 Artifacts are 'Torment killers'. Phase 2 Artifacts are 'Elemental Weapons'. For Phase 1 weapons, you select from a list based on realm. All of these weapons are useful but not the best outside of synergy - regular attack weapons seem to have 275 attack (Daggers and ranged options are a little lower). Their real value comes from being in synergy - in their appropriate synergy (or brave synergy), Phase 1 weapons have a whopping 511 attack, /and/ they boost /every/ element (including non-elemental!). These are fantastic choices for helping you push through a torment you're having some trouble on, and would see extra value during omni synergy events (Crystal Tower, regular Realm events, the various storyline events we've received like Cardia Islands, if you still have some nightmare dungeons to whomp, etc). Phase 2 weapons do not get synergy anywhere (except Brave Synergy). Instead, they all boost an element natively. At 300 attack, these will beat your existing weapons in general, possibly even in synergy (although a combined 6* weapon may beat them under synergy, I guess?). These are basically 'Pick your weapon type, pick the element for them to boost' with a few exceptions. - You can only get each weapon once, so if you already have (say) the physical lightning dagger, you can't get a second one so you'll have to pick another weapon type. - Certain characters have legend materias and dive bonii that are things like 'Do extra damage with spears'. - Sharpshooter encourages you to use a ranged weapon, and you may want to have a ranged weapon in general for back row defenses. - You just think it's cooler for Gau to punch things over knife them. There are even /three/ +30% dagger damage RMs, on Lilisette, Ignis, and Vaan, so RM wise you're set. I have no idea why there are /three/ +Holy mind harps, and no +Holy mind /bow/ (nor mind gun for Yuna) nor why some of the combinations are just skipped. It's weird. The Blitzballs showed up a little later than the others in Japan. In general, Phase 2 weapons are better than Phase 1 weapons. Phase 2 weapons are applicable everywhere, and at 300 attack will serve you wonderfully in torments. Meanwhile, phase 1 weapons are /only/ useful in torments (And other synergy-based content; notably not 5* magicites or apocalypse fights outside of their realm). Still, 511 attack is a lot, and 'beats up torments' is not a bad thing. It seems that the common consensus is to get one or two phase 1 weapons, and then save the rest up for phase 2 weapons when those finally come out. The moment the feature lands, you'll be able to turn everything in your vault into Rainbow Crystals, so they'll at least stop taking up space in your inventory. In Japan, they received a Phase 1 FFV dagger for free as a promotion for the event starting. It still needed to be powered up, mind you. 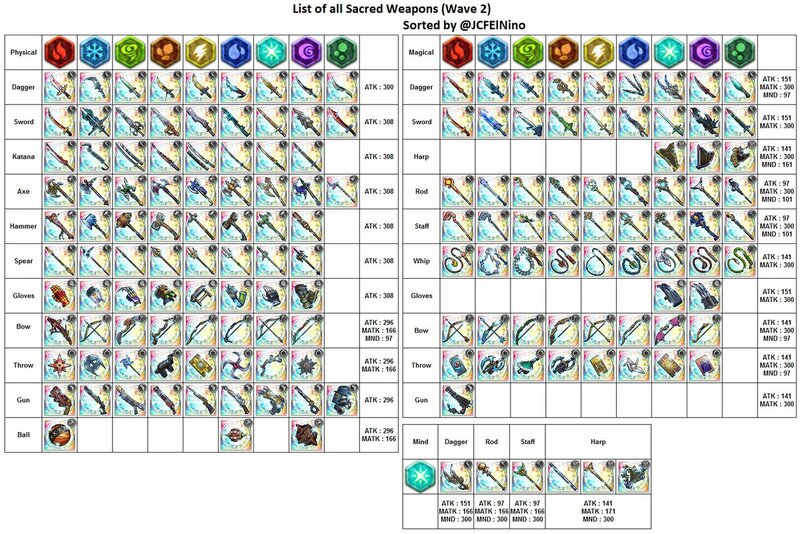 TL;DR - Save your 1* to 4* relics for Artifacts, Phase 2 weapons are better than Phase 1 weapons but both are kind of amazing. Lounas, Zodiac, Starkiller and 5 others like this. This system exists to encourage you to utilize your already-level-99 characters to do the daily grind. Once it is released, every battle level 99 characters participate in will give that character one Magia XP. Enough Magia XP gets that character one Magia Point. Notably, it doesn't matter how much stamina the battle costs - if you want to grind it most efficiently you should head back to Fabul Castle. The rewards are also minor, however - you get a very small amount of HP, attack, magic attack, defense, resistance, mind, elemental attack, or elemental defense. You can reset it... periodically? I actually can't find how often you can reset your magia points, but it's something like every week or so. Too long for 'Let me swap for this one fight then swap back', but not so long that you're locked forever into where you spend your points. Each of these caps at 100 points (+10% damage per element, +10% resistance per element, +100 atk/def/mag/res/mind, +500hp). The magia XP costs skyrocket fairly swiftly, but you can get to Lv2400 to cap them all out. From a practical perspective, the first couple hundred points are reasonable. Boosting defense or resistance is then multiplied with wall or protectga or the like and thus is helpful for survival. Raising your atk or mag respectively also may help, as will elemental damage up if the character is mostly mono-elemental. The elemental resistances are nearly useless as they don't stack with accessories, and if the enemy is reliant on a particular element you're going to want to properly resist that element. There are thus two advantages to elemental resistances. And secondly, if you can get it up to at least 1% elemental resistance, then penalties on your existing gear are overwritten. Thus, if you have 1% water resistance, that character can equip a Gigas Armlet (which normally makes you weak to water) without having to deal with the weakness. The various Halloween 'cursed' items we got lately make this use of elemental resistances more appealing as well, and Gigas Armlets are useful. Magia is... extremely grindy if you want to max it out. It seems most people in Japan did the first few levels of it then stopped hyperfocusing on it, letting the remainder come via doing the daily. This isn't really an awakenings guide, but it's worth noting for planning purposes since these also show up in quantity soon. Incredibly powerful soulbreaks called Awakenings will be showing up in the 4YA. Many people had been saving up for these for months. Kingdom Hearts showed us their debut with Sora/Riku/Roxas/Axel all having Awakenings, haha, but we still have some powerful ones coming. In Japan, the five new ones were (in banner order in Japan): Tidus, Kain, Butz, Terra, and Zidane. In Japan, Butz and Terra's awakenings were on one banner, and that one was considered the strongest of the banners by a healthy margin. - More damage with abilities of their type the more well honed they are (so a rank 5 Lightning Dive will do more damage than a rank 1 Lightning Dive). There are exceptions to these rules (Kain being the most notable one), but this is generally how they work. Basically, they're our next tier of power creep and worth dive tackling as they come up. They become more frequent over the next few months, and our summer fest should have 3 per banner. 4YA also introduces realm chains. We have them in torments as it is: 30/30 atk/mag buffs (A'la Onion Knight's BSB) and everyone of a particular realm's damaging actions increases the chain. TL;DR - Awakenings are super powerful soulbreaks and will show up in 4YA, if you're not trying for Awakenings on the kingdom hearts banners you should probably save for them on 4YA. Also, by general consensus, Butz and Sora have extremely strong Awakenings due to their ability to hit many elements. Terra is a bit behind them, with Axel a little behind her. Also I'm hoping to dive tackle Kain's. Because I love Kain. He probably has the weakest Awakening, haha. And that, as they say, is that! Hopefully these help you plan for things coming in the 4YA. If you take nothing else from this, try to save all your relics in the vault - it is absolutely worth spending a couple mythril to expand your vault to get at powered up Artifacts that much more quickly. Don't forget, if you need additional help, there are usually people in this forum's chat who are willing to help. I would then like to once again cite reddit as the source of all of this information, and all of the links thereof are from there. Lounas, Starkiller, Levant and 5 others like this. Zodiac, Starkiller, Levant and 4 others like this. Kanto you're awesome, thanks for putting this info together. I've been tracking it all on reddit, but haven't delved into some of the details. For legendary weapons, they will be called "Artifacts" (already data mined). I would definitely save all your rainbow crystals for the 2nd round of relics. Don't bother with the first! There are some very hard to find element bonus weapons for certain elements (fire for physical, wind for magic) and you'll want to get those to help improve your teams! Deuce and Kantolin like this. Kanto you're awesome, thanks for putting this info together. For legendary weapons, they will be called "Artifacts" (already data mined). I would definitely save all your rainbow crystals for the 2nd round of relics. Don't bother with the first! While this is completely reasonable advice, by the time the Phase 2 weapons came out, many Japanese players had over 10 of them. Thus, it's okay to spend one or two on the Phase 1 weapons so you can play around with the system a bit - you'll still have access to plenty of the Phase 2 weapons, especially as Lithographs keep coming. In a way, it's a lot like Mythril. Generally speaking, the longer you save, the better your rewards from your mythril will become... but at some point, you can spend a couple of your mega-elixirs and it's okay, you'll still have plenty for the future, haha. Completing characters is definitely a goal of most of the lower set! I think folks should do an inventory of what they have in their vaults today that they can sacrifice towards artifacts, their existing +element weapons, and where they need to plug holes before spending on this first run of artifacts. It seems to me that for my own needs, I'd be better off holding off for +element weapons where I can fully boost the weapon and have more elemental weapons for off-realm battles (which are the majority of fights). I'm also a whale and have tons of "spare" relics, I suspect not every one is in the same boat. One minor point. Accessories can turn into rainbow prisms as well. So your 17th +30 Attack accessory has value. I really enjoy reading your guides, keep up the good work @Kantolin ! So what is the best way to use the "Upgrade Blades"? Do the same rules apply or should i upgrade/combine/augment them before turning into rainbows? Just replace it straight will yield you the most rainbows.